Room Booking Solution | Haramayn Group Nothing worry about accommodating your guests providing them transfers facility making it all available on a single platform or arranging tours because Haramayn Group have solution for everything. You can now keep your business updated and intact with new travel demands through white label. 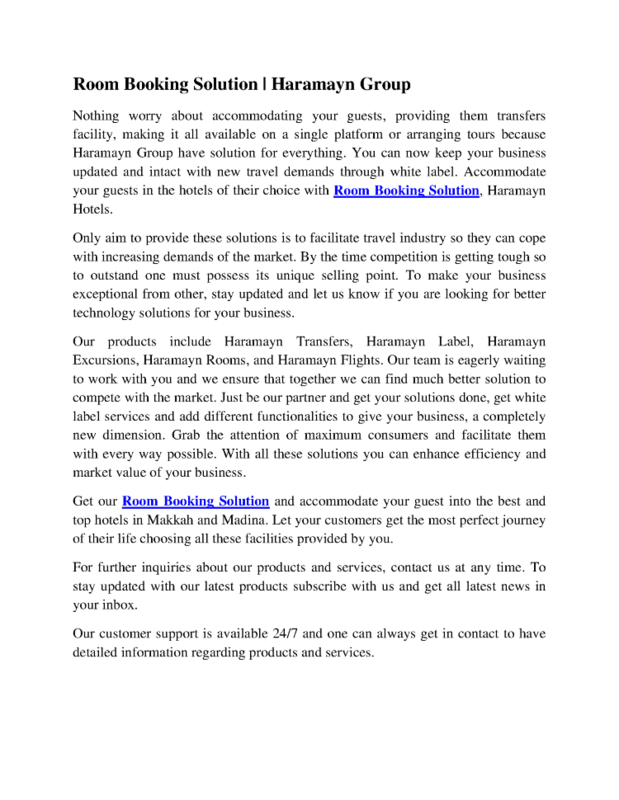 Accommodate your guests in the hotels of their choice with Room Booking Solution Haramayn Hotels. Only aim to provide these solutions is to facilitate travel industry so they can cope with increasing demands of the market. By the time competition is getting tough so to outstand one must possess its unique selling point. To make your business exceptional from other stay updated and let us know if you are looking for better technology solutions for your business. Our products include Haramayn Transfers Haramayn Label Haramayn Excursions Haramayn Rooms and Haramayn Flights. Our team is eagerly waiting to work with you and we ensure that together we can find much better solution to compete with the market. Just be our partner and get your solutions done get white label services and add different functionalities to give your business a completely new dimension. Grab the attention of maximum consumers and facilitate them with every way possible. With all these solutions you can enhance efficiency and market value of your business. Get our Room Booking Solution and accommodate your guest into the best and top hotels in Makkah and Madina. Let your customers get the most perfect journey of their life choosing all these facilities provided by you. For further inquiries about our products and services contact us at any time. To stay updated with our latest products subscribe with us and get all latest news in your inbox. Our customer support is available 24/7 and one can always get in contact to have detailed information regarding products and services.